Reliably create and distribute PDF documents and forms with Adobe Acrobat 9 Standard software. Combine files from multiple applications in a single PDF file. Easily create fillable PDF forms to collect data electronically, and apply basic document-security features. 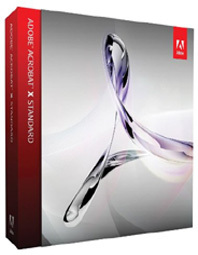 Adobe Acrobat Standard includes the following features. (Other versions of Adobe Acrobat--Adobe Acrobat Professional and Adobe Acrobat Pro Extended--provide further features.